Cygnus Scale Conversions produces a line of resin-cast conversion kits that allow users to customize their model airplanes and build faithful replicas of aircraft used by the various branches of United States armed forces. Cygnus Scale Conversions currently offers 14 conversion kits in 1/48 and 1/32 scale for selected Revell/Monogram, Hasegawa and Tamiya plastic model airplane kits. Most of these kits come with decals for one airplane, while some include markings for two or more planes. 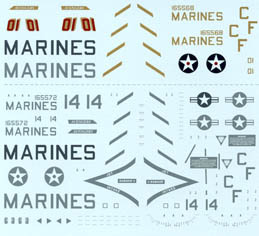 Cygnus Scale Conversions' 1/32 scale Harrier AV-8B decal sheet for VMF-211 Wake Island Avengers. This is our first decal sheet for sale that does not accompany a kit. 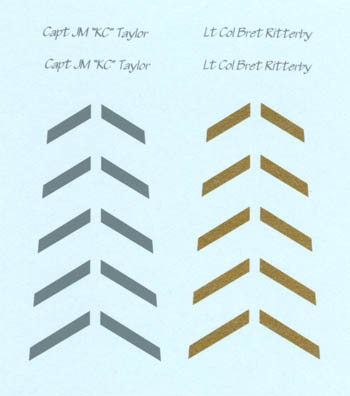 The sheet offers two subjects, the Squadron Commander's aircraft and one "line" aircraft. The markings are for the Harriers newest paint scheme. The price is $ 15 post-paid domestic and $ 17 post-paid overseas. See our kit catalog for ordering details. Some notes on why it takes so long for me to ship your kits: First, I am the only guy running the whole company. Each kit has several parts all of which must be accounted for when I ship. I am also the Director of Logistics for the Tennessee State Guard, meaning I am responsible for the procurement and supply of some 400 personnel spread literally from one end of Tennessee to the other. This job takes a lot of time and energy. Also, like most of you, I have a family, a dog, 2 cars a house and a yard all of which needs my attention. If you have used one of Cygnus Scale Conversions' kits, visit our Photo Gallery to learn how to submit photos of your aircraft for display on our site. If you have any questions about Cygnus Scale Conversions,or any of our kits, drop us a line at carltonjc@comcast.net . Contact us via Mail Telephone or Fax.